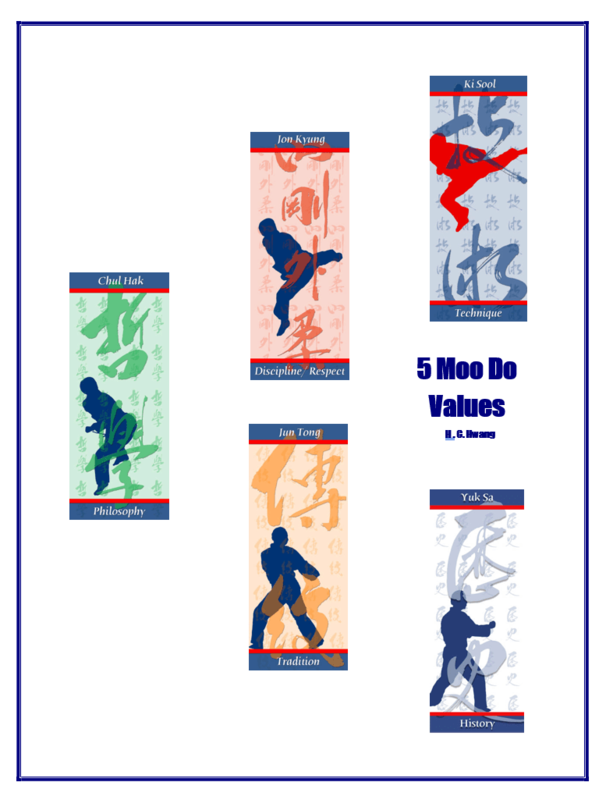 The 5 Moo Do values of History, Tradition, Philosophy, Discipline/Respect, and Technique, are the backbones of our proud Moo Do identity. These values coexist interdependently with each element strengthening the meaning of the other four. When we apply the 5 Moo Do values to our daily training we strengthen our self not only as a Moo Do practitioner, but also as an individual who provides a positive influence within our society. 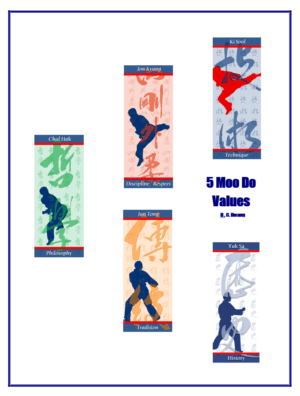 I trust this discussion of our 5 Moo Do Values will help Moo Duk Kwan® practitioners to include them in all aspects of your life as basic action elements in your behaviors rather than just being concepts to speak about. “History is a chronological record of significant events (as affecting .... an institution) often including an explanation of their cause” (Webster’s Ninth New Collegiate Dictionary <1989>). These events, causes and the individuals involved, become the second heavenly nature of the institution/organization/concept. History defines us. We understand who we are by knowing our history (past). This knowledge helps guide our actions with an awareness of our foundation, our history, our past, and helps us understand where we are in the present as we create our future. Our history (Past) is the guiding source for our future life. We can create our future by honoring our History (past). The experiences of our elders, seniors and instructors are part of our past, so we honor (respect) them because they created the foundation upon which our present has been built and their experiences serve as a guiding source for creating our future. We can benefit from listening, valuing, and respecting their teachings and the wisdom they share with us about their experiences. Loyalty, commitment: the act of binding yourself (intellectually or emotionally) to a course of action; a prime virtue, unswerving in allegiance, and implies a faithfulness that is steadfast in the face of any temptation to renounce, desert, or betray. Regretfully, loyalty is often motivated by a desire for a position, power, or money. However, this type of insincere loyalty will not last when the position, power, or money situation changes. Individuals who have failed in their loyalty often seek to hide their past. If loyalty is established based upon history, then loyalty will never change because the History upon which it is built will never change. Consider some additional behaviors that we can initiate to put our History into our actions. We can be a good example (human story) by upholding our loyalty as demonstrated through our behavior even during difficult situations. People learn from and appreciate our example (story). History strengthens Tradition, Philosophy, Discipline/Respect, and Technique. Do my behaviors reflect my history? Do my actions demonstrate and honor my history? “Tradition is that which is inherited, established, or transmitted and passed on as a customary pattern of thought, action, or behavior; the handing down of information, beliefs, and customs…” (lbid). This is the process by which the essence of Soo Bahk Do® Moo Duk Kwan® is maintained. There are traditional means of conduct and beliefs which were handed down since the inception of the Moo Duk Kwan®. Some originated even before the Moo Duk Kwan®. These traditions began at some point in history. The tradition of bowing is a show of respect and/or appreciation. Once upon a time as students were receiving instruction from a teacher and were enlightened from the instruction of their teacher, their overwhelming happiness may have motivated them to lower their body in order to look up to their teacher in respect for, and appreciation of, their teacher. This could have been the birth of the bowing tradition. Since that time, students’ desire to celebrate and remember the spirit of learning, respect and appreciation have been preserved through the tradition of bowing to the teacher. The bow has become a tradition to show the spirit of joy, respect and appreciation. The bowing tradition carries on this spirit. Can you imagine if they did not share the bow after that? There would be no spirit of respect and appreciation. There is no life of learning if there is no spirit. Perhaps you recall a particular moment (playing cards or sharing a particular brand of drink etc.,) when you established a friendship with someone. You may recreate that special moment of the birth of your friendship from time to time as a tradition to celebrate the spirit of the moment when your friendship was first born. Your friendship will be strengthened, healthy and full of spirit when you keep that tradition in your meetings. However, your friendship may suffer or diminish should you neglect the tradition. Our traditions strengthen our spirits and create a positive influence and connection with the other four Moo Do values. Consider these two families and the traditions in their lives. The Smith family celebrated a holiday by decorating their house and selecting costumes and candy as they prepared weeks beforehand in the spirit of the holiday. The children were having a joyful experience during this time and were filled with excitement and hope about the coming festivities. The Smith family members and their neighbors became closer and their relationship was strengthened through these traditions which had a very positive effect upon human relationships. The Tom family was too busy and tired to prepare for the holiday and chose to just watch Television instead of observing the traditions of the holiday because doing so would require work. Their home and family members showed no holiday spirits and the children had no reason to be excited or filled with anticipation and excitement. Those who carry high spirits. Those who Honor and perform rituals and techniques that embrace habits from past generations. Do my actions preserve my traditions? Do my behaviors embody my traditions? “Philosophy is a set of ideas or beliefs relating to a particular field or activity; an underlying theory, a system of values by which one lives; the most general beliefs, concepts, and attitudes of an individual or group…”(lbid). Our philosophy guides our intent (Shim Gong) toward the good. Our philosophy includes the 8 Key concepts, the 10 articles of faith on mental training, and many other ideas and values. Our active study of these tools and our application of them as a Moo Duk Kwan practitioner strengthens our life and demonstrates the philosophy we live by. In training, our first Shi Sun is an action of intent. Our intent is much clearer when it is based upon our philosophy. We experience a good class for both your mind and body when our intent is clear. When Peter greets his instructor upon arriving at the Do Jang and again when he leaves the Do Jang, then his courteous behavior may also extend into his life beyond the Do Jang. It becomes a good foundation for him to build the human relations with his behavior. Peter’s intent was strengthened by the Jhoon Bee philosophy “start good, finish good.” Philosophy strengthens Discipline and Respect. Our intent guides our actions. Our actions will be meaningful when they are initiated with good intent. Does my behavior demonstrate our philosophy? Discipline and respect are the foundation of human relations. Discipline will strengthen your professional conduct. Respect will strengthen your kindness. Discipline alone may bring the hard side which makes others uncomfortable. Respect alone may bring the soft side which makes others overly comfortable. These factors alone will bring a negative influence on human relations. Discipline and respect should coexist with each other to gain their full benefit for human relations. Furthermore, they should be strengthened by the other four Moo Do values in order to fulfill their meaning. In other words, Professionalism (Discipline) and Kindness (Respect) alone are not what we strive for in the Moo Do world. In the end, they will be nothing more than sales tactics. Alone, they may merely be the tools for “people skills” that sales representatives use at stores. Professionalism (Discipline) and Kindness (Respect) must be strengthened by History, Tradition, Philosophy, and Technique in order to fulfill their true values. Proper postures (ways of standing and sitting posture). While we respect individualism, providing visual demonstrations of body images that reflect Discipline and respect in the class can be helpful to connect our thoughts of respect to our body mannerisms. Do I have discipline in my behavior? Do I have respect in my behavior? “Technique is the manner in which technical details are treated or as basic physical movements are used…”(lbid) Techniques are very visible elements of Soo Bahk Do Moo Duk Kwan. We gain the benefits of flexibility,self-defense skills, and health as we train to improve our techniques. Techniques from Ki Chos, Hyung, and Dae Ryun are excellent tools for connecting with the other four Moo Do Values, History, Tradition, Philosophy, and Discipline/Respect. From this connection, we benefit by strengthening our techniques. Seeking to apply all our Moo Do values during our technical performance of techniques helps us to understand the relationships between our Techniques and the other four Moo Do values. Techniques when performed based upon, and strengthened by, History, Tradition, Philosophy, and Discipline/Respect will develop beyond just physical techniques. When we perform Soo Gi or Jok Gi techniques with good Huh Ri extension, connect our value of using Huh Ri to our unique identity as a Moo Duk Kwan practitioner. Our identity, as well as our techniques, are strengthened. When we perform “Jang Kap Kwon Kong Kyuk” or “Yuk Ro/Chil Song Hyung”, we are connecting with the values of History (and/or Philosophy) of Soo Bahk Do Moo Duk Kwan and they will become more than techniques. By training in our Techniques and applying the guidelines of the 5 Moo Do Values, our training becomes a freedom that provides new realization, understanding and creativity. We become connected not only to the art’s history, but we also become the foundation of the art’s future creativity. Through this process, both History and Philosophy will be strengthened. When we perform a traditional ceremony during our training (bowing with Sa Bom Nim or partner) and we connect with the meaning and spirit of our bow, then our Moo Do Spirit (Moo Do Chung Shin) becomes fuller and will guide our training to the fullest. Tradition is strengthened. When we connect Discipline/Respect to our training, then our techniques and attitudes become more effective and enjoyable. We can seek to enjoy the application of Discipline and respect in our training and both will be strengthened as a result. How do I approach, respond, to and behave based on different circumstance? Mental and Physical mannerisms which are strengthened by the 5 Moo Do values can be the most powerful techniques we may possess. These mannerisms give you an ability not only to defend yourself but also to build toward a peaceful world.